Well, no, it’s not, but it’s not good, either. Housekeeping is not a strong point with me. Instead of being the superwoman I am in my imagination, I spend hours standing in my slightly messy house wondering what to do next. What to do first. Where to begin. I’m at a stage where everything is functional, but there are small piles of clutter scattered about the house. I know to conquer them one pile at a time, but I’m overwhelmed — or else underwhelmed, because there are always things I would rather do, like cook, or write, or go for a walk, or take a nap. 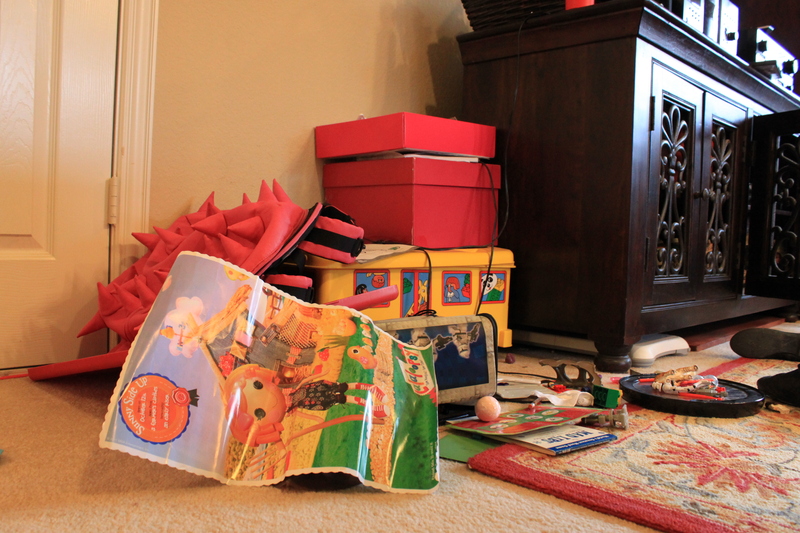 I just went and took a picture of a pile of toys upstairs that’s been there for a few days (weeks). Chris said, “So you do see the mess.” I do, but I don’t know where to begin to deal with it. So I’m doing what I know to do, and that is to write about it. If he saw the mess, why didn’t he pick up the stuff or have the kids do it? Chris does more housework than I do — and he has a job and I don’t. Yay Chris! I’m a fan, too. And yes, that little pile does look messy. But it’s their playroom, and they’re kids, bless their hearts.